A few late noms fleshed these fields out. The Captain Cook has lost two of its star players in Mime and Sensible Princess. The Telegraph beckons. Already won group and listed races here. Might have to sit off what looks like being fast pace and slingshot them. This frontrunner looks only obstacle for stablemate to overcome. Every chance he will get into speed duel with Ballybay and suffer the consequences. Career marked by wide draws and poor rides. Can't see her lowering favourite's colors. Stipe Comment last start: Girl of Power - Raced keenly in the lead in the early to middle stages. Handled first test on good ground with aplomb. Surprisingly not nommed for Wellington Cup. Fell out of gates last start and was pushed to get into the race. Beat some handy types start prior. Going from mile to two miles. Needs the work to boost Wellington Cup claims. Espumoso takes name from mum. In Spanish it means Sparkling. Simply looks too classy for rest. Hit out sweetly at track this week. Slow away debut and awkward ride late. Been to trials since and won. Ear covers have worked wonders. Will win soon, probably in something that doesn't include Espumoso and Karaka Million contenders. Stipe Comment: Lite My Tiger - Crowded passing the 1000 metres and checked, losing considerable ground. Didn't get the mile of the Wellington Stakes. 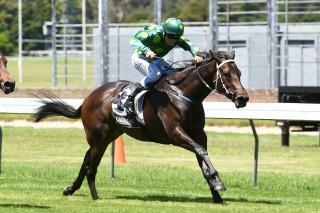 There must be doubts about the 1400m too but does know how to win at Trentham. Lay in under pressure last start. Shadow roll on in bid to fix that flaw. Stipe Comment:All In Mana - Raced three wide without cover throughout. Lay in under pressure in the home straight having to be straightened. 6th in Thomson here late Oct and then given time off. Resumes in time for summer. Won Trentham carnival in Jan.
Too good freshup, well beaten first time in R65. Good each way dropping back to special conditions race. Won at Trentham last 2 summers. Not in the best of nick but it's a stat worth keeping in mind. Sooner or later that decent tote support will amount to something. Jason Waddell returns from a three-week suspension and is legged onto the favourite in a $200,000 Gr1. Needs two more wins to rival Mufhasa's Gr1 record of 8. No reason why he can't get there. Cuddle Stakes winner here in March. Didn't handle slow ground when beaten by Gingernuts Hastings carnival. Unbeaten 2 from 2 record at Trentham to protect. The daughter of Ethereal looks all grown up now. Building strong momentum toward an Auckland Cup bid, where is $31 on futures market. Holly Andrew went long way to ride last start and her journey was not wasted. The horse loves Trentham, placing 5 of 6. At least one of those should have been a win. Stablemate scr. This one looked a better chance.